Welcome to the Mayfield and Ellastone Community First Responders’ website! 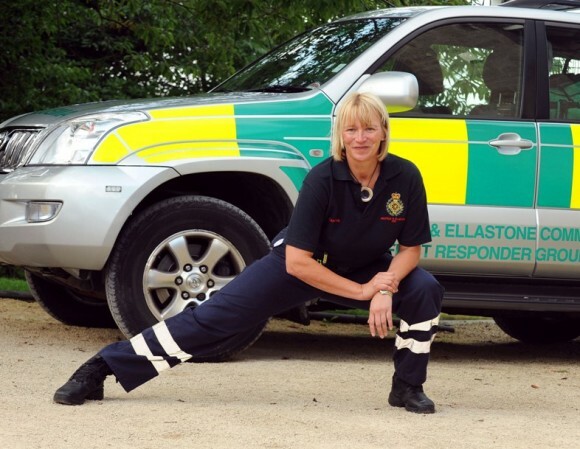 The group was first formed in 2002 and is now part of the West Midlands Ambulance Service. If a 999 call is made in our area, we are contacted and are usually first on scene, often while the 999 call handler is still on the line. 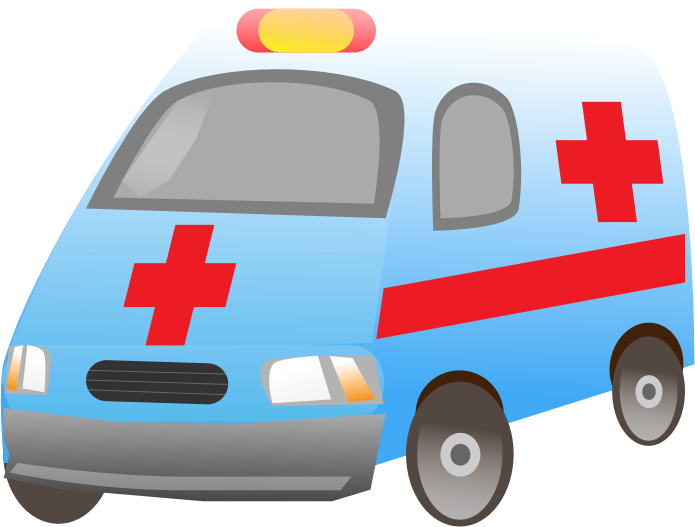 Our trained responders can start treatment straight away but are always backed up by a professional paramedic and/or ambulance crew. 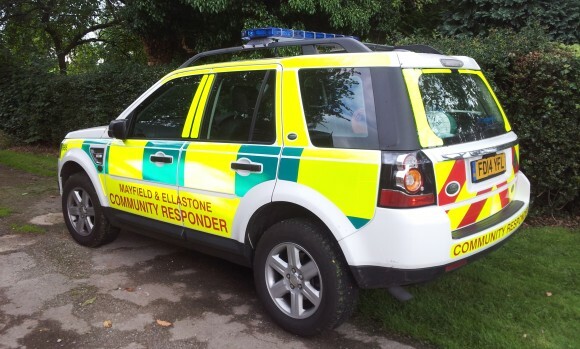 Our latest vehicle is a Freelander, which was bought with funds raised by the local community. All responders are local villagers who know their area well. Although we may be neighbours, rest assured that all details of any call-out remain totally confidential. A defibrillator is a machine that delivers an electric shock to the heart when someone is in cardiac arrest. These machines can also be called AEDs (Automated external Defibrillators). Anyone calling 999 will be given the code required to remove the kit if someone is in cardiac arrest. No training is needed to use the machine, which will electronically ‘talk’ the user through the step by step process of administering an electric shock if it detects an abnormal heart rhythm. 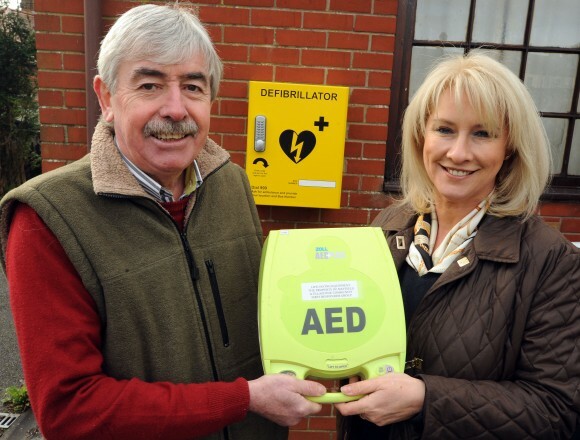 There is a defibrillator for local people to use in both villages. The one in Mayfield is installed on the Conygree Lane Memorial Hall wall in Mayfield. The one in Ellastone is housed in a locked yellow metal box located in the porch at Ellastone Parish Hall. If someone has a heart attack, or you suspect that is the case, you should phone 999 and they will provide the code for the box. Someone should commence CPR if possible and another person should go to fetch the defibrillator. Once back with the patient, the defibrillator lid should be opened and the box will give verbal instructions.Basically the sticky pads should be fixed to the chest and if there is what is known as a shockable rhythm, the defibrillator will instruct you to press the shock button. The instructions are very loud, very clear and very easy to follow. The operator on the end of the phone will not ring off until a paramedic arrives so you will be supported throughout. Watch the video clip on the Heartstart video clip to find out more. When someone goes into cardiac arrest, every minute without CPR and defibrillation reduces their chances of survival by 10%. Our local First Responders are willing to provide basic Heartstart training. Get in touch (see above).